Edison High School Senior Dominic Carrasco will walk the stage at graduation on Saturday with plans to be the first person in his family to go to college. Carrasco didn’t always have such aspirations, but his involvement in Communities in Schools San Antonio (CIS-SA) and our Inspire U mentoring program encouraged him to take the next steps to pursue higher education. Mike Malone, a CPS Energy manager of environmental and sustainability services, invested time out of his busy schedule to mentor Carrasco through Inspire U, a one-on-one mentoring program that pairs at-risk students with employees from local participating businesses. Carrasco is one of 27 students – all of whom graduate this spring – to be paired with a CPS Energy mentor during the 2014-15 school year. Our Corporate Responsibility team works with Communities in Schools – San Antonio (CIS-SA) to pair employees with students from Edison, Kennedy, Sam Houston and South San high schools. Inspire U mentors meet with students at monthly meetings and at their schools at least once a month to encourage them to graduate and pursue higher education. Edison High School Senior Dominic Carrasco is one of 27 graduates involved in the Inspire U program. 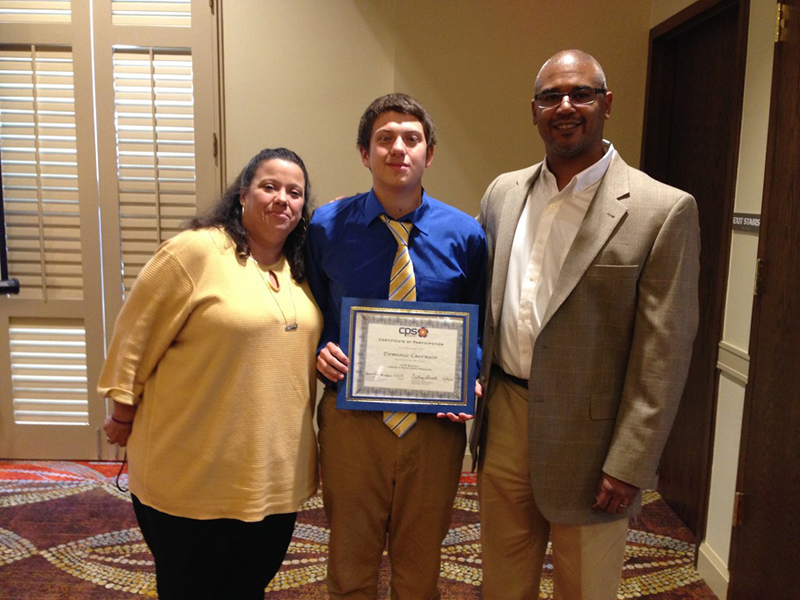 Carrasco recently celebrated with his mom, Barbara Daughtry, and his mentor, CPS Energy Manager Mike Malone at an end of year luncheon. Malone has volunteered as a mentor since the program’s inception in 2008. Dominic is the third student to graduate under his mentorship. Malone encouraged Dominic to find out what he wanted to do in life and work hard at it. With Malone’s motivation and support, Dominic not only boosted his grades but made plans to pursue a career as a high school teacher. Along with the typical pressures of high school, at-risk students face poverty, abuse, broken families and other circumstances that pose as major obstacles to graduation. Ilsa Garcia, volunteer manager of CIS-SA, believes it’s vital for these students to have good role models that aren’t just focused on their academic performance. 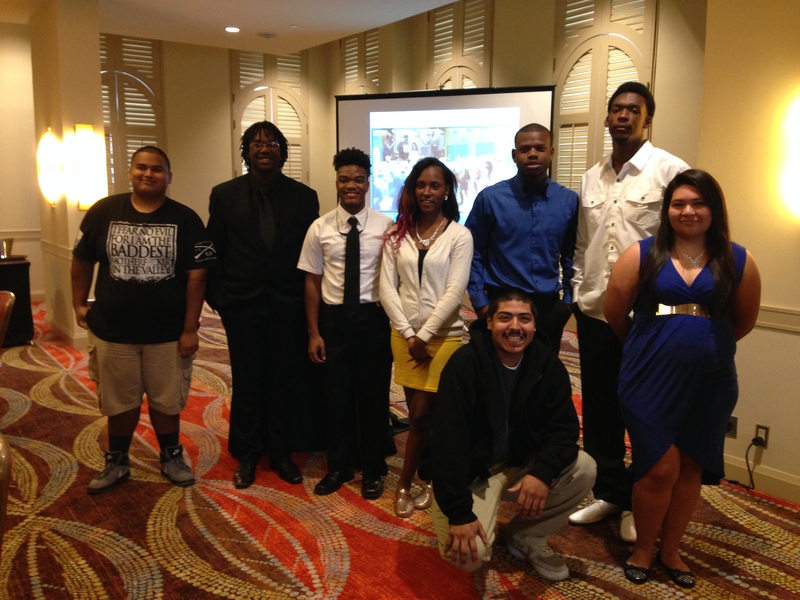 Graduates of Sam Houston High School are recognized at the end of year Inspire U luncheon. At the end of year celebration at the Hilton Palacio Del Rio, mentors, parents and CIS-SA coordinators cheered on the students for completing another successful year. The group shared smiles and shed some tears as the graduates said their goodbyes. But those in the program weren’t the only ones moved by the inspirational scene. The catering staff of the hotel got teary eyed and shared their own encouraging words for mentors.